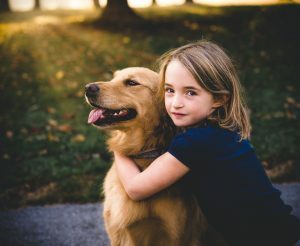 Paws and Affection companion dogs are highly trained dogs who assist their child partners with the same skills as service dogs, but they do not have public access. These dogs instead act as home helpmates, performing tasks around the house, empowering their child partners with independence and giving them a sense of ownership. For families who do not want the responsibility of handling a dog in public or maintaining public access training, a companion dog is a wonderful alternative. These dogs sometimes qualify as Emotional Support Animals (ESA’s), allowing them to live in housing that doesn’t allow pets and to fly in the cabin with their handlers on airplanes. Contact us to learn more about our companion dogs and to see if you or your child might be a candidate. In addition to companion dogs, Paws and Affection also trains service dogs and facility dogs.